What is Breast Engorgement – What Causes it? Firetrucks are some of the best options when you’re looking for toys. Every kid and toddler love this form of playing because it’s active and never bores. When you buy your child a firetruck, they will be able to play with it both inside and outside. If it’s rainy, they can treat the house as an obstacle course. If not, they can get valuable exercise outside by pushing the truck around. Playing with firetrucks improves children’s spatial awareness and gives them the opportunity to be physically active. Plus, if the design is great, they will love it even more. There are so many different firetrucks on the market. 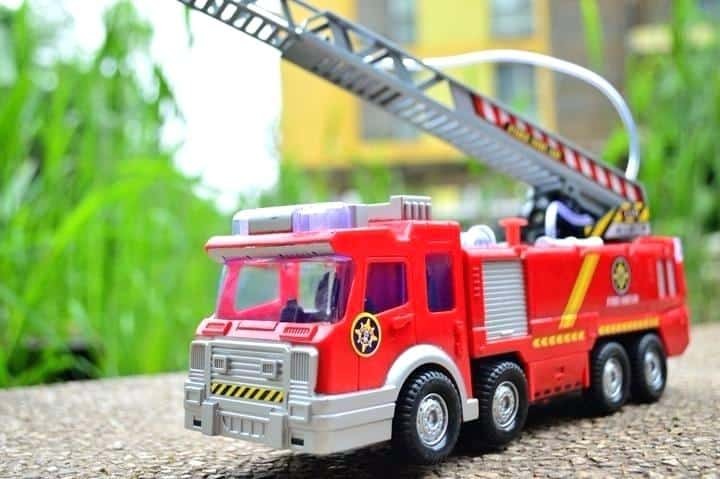 To help you make the right choice, we’ve assembled a list of the best firetruck toys for kids and toddlers. Each of these toys will occupy your children for hours on a daily basis. Why we like it: It’s made out of eco-friendly materials, which is a big plus. It’s also very lightweight and kids can master it quickly. One of the best things about this truck is that your child can play with it both inside and outside. It has strong wheels that can even withstand harsher terrain in a park or on the playground. It’s excellent for building fine motor skills and giving the child a permanent toy they can devote their time to. Green Toys have made an excellent approach in focusing on eco-friendly packaging. 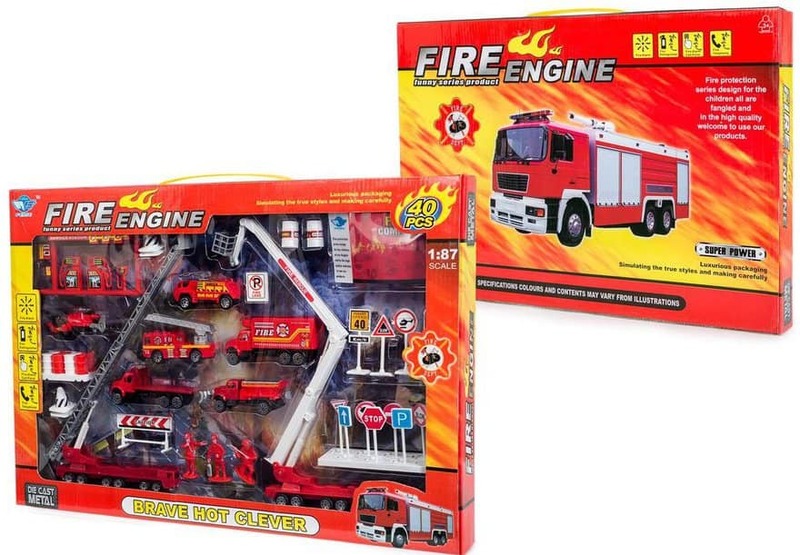 Both the fire truck and the packaging are made out of recycled, biodegradable materials. The truck is also FDA approved by being safe for your child, in addition to benefiting the environment. The dimensions of the truck are also perfect for all age groups, including even toddlers. Your child will have no problem lifting the truck up and carrying it around. Why we like it: The truck is very realistic and includes a lot of details. With the addition of figurines, it’s an immersive experience. The very best firetruck toys aren’t just for developing motoric skills. Sometimes, your kid or toddler will want to make up a fictional scenario and play fireman. 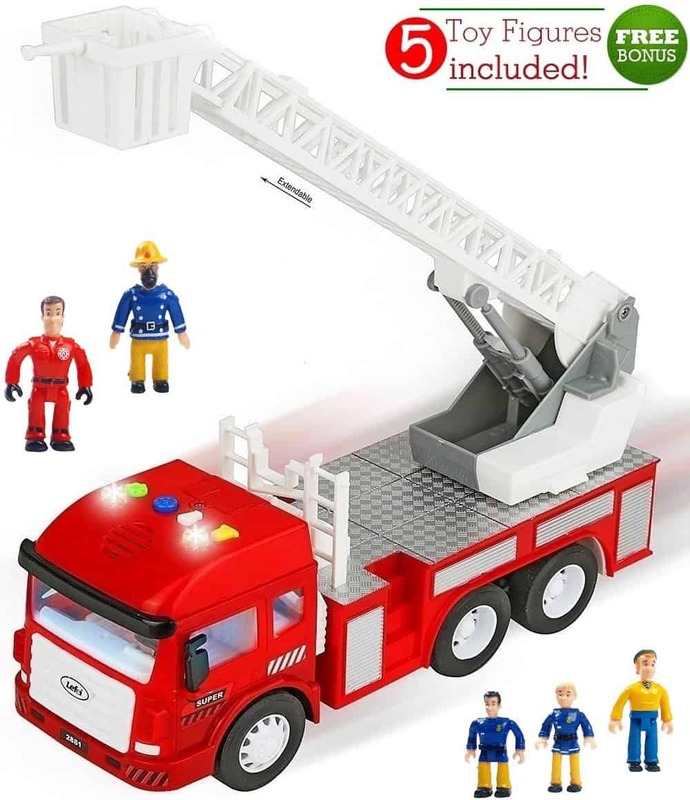 With bonus figurines, your child can use this truck to play fireman and save the day. Figurines include both firemen and civilians, allowing for interactive play. With a special friction mechanism, the truck’s wheels can safely rotate on any surface. This is great for toddlers, as they will learn how to master various push and pull movements. Moreover, the materials are also safe, with a minimal amount of moving parts. 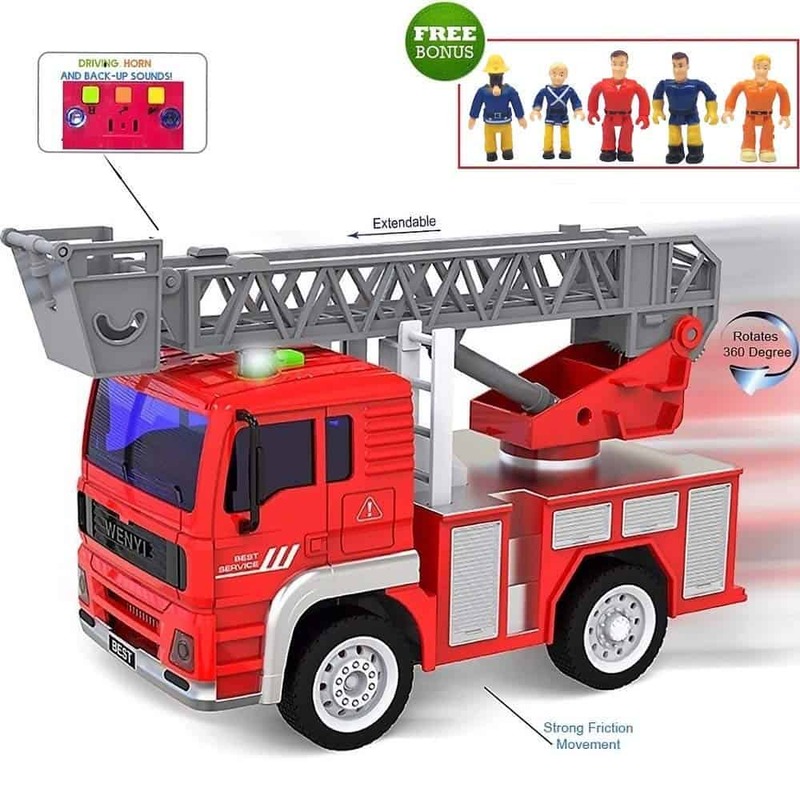 Additional excitement is possible with siren and light features on the truck, with three sound effects and a ladder that the child can extend. Why we like it: Due to the figurines, the child can create a number of different playing scenarios. The ladder is also very flexible. Kids adore this truck mostly because of its realistic design. Every detail has been carefully designed and painted to be as close to the real thing as possible. With this level of detail, your children will immerse themselves into interactive playtime. Another bonus is the five figurines that are included in the packaging. What sets this firetruck apart is the addition of the swiveling ladder. It even has a basket that can fit two of the firemen figurines. The mechanism in the ladder is easy to navigate and it’s an excellent way for toddlers to learn how to grip things and move them with their hands. With an effective push and pull system, the truck won’t stop even at rocky terrain. Ideal for both inside and outside use. Why we like it: This truck is excellent for developing children’s imagination. A retractable fire hose adds a new form of fun. LEGO is the kind of toys that enhance imagination and building capabilities. This firetruck isn’t too hard to build, but your kid will love the challenge it presents. With 26 pieces, it can be used in more ways than one. The child will value the toy much more because they will have built it all by themselves. 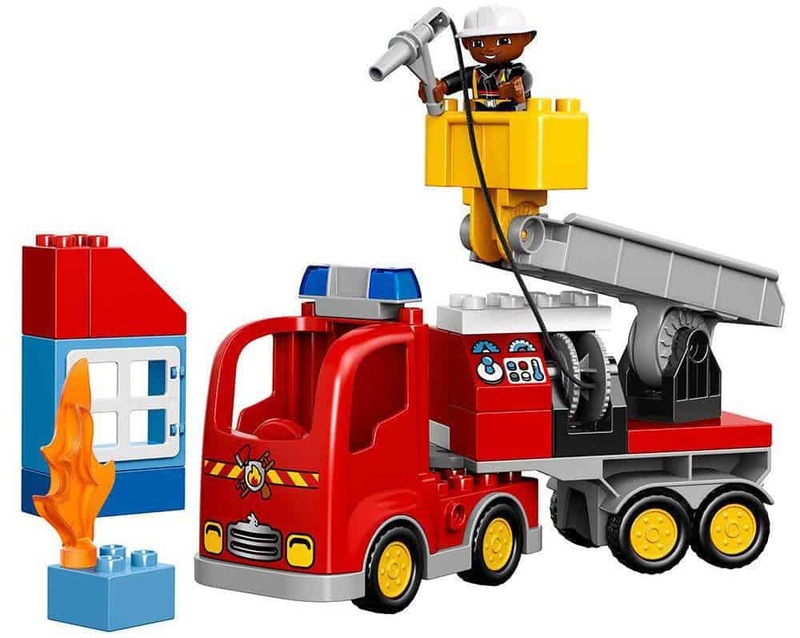 This is also a good excuse to buy other LEGO sets, given the fact that this firetruck is compatible with other building sets. All the parts have been made for small hands, but not small enough to be deemed unsafe for toddlers. Young boys will find this toy especially interesting because it blends easy-moving wheels with an impeccable design. Why we like it: It comes with excellently built figurines, with premade stories about each. There is no building involved, so it’s ideal for smaller children. This Paw Patrol set is designed to enhance the minds of toddlers and children up to two years old. 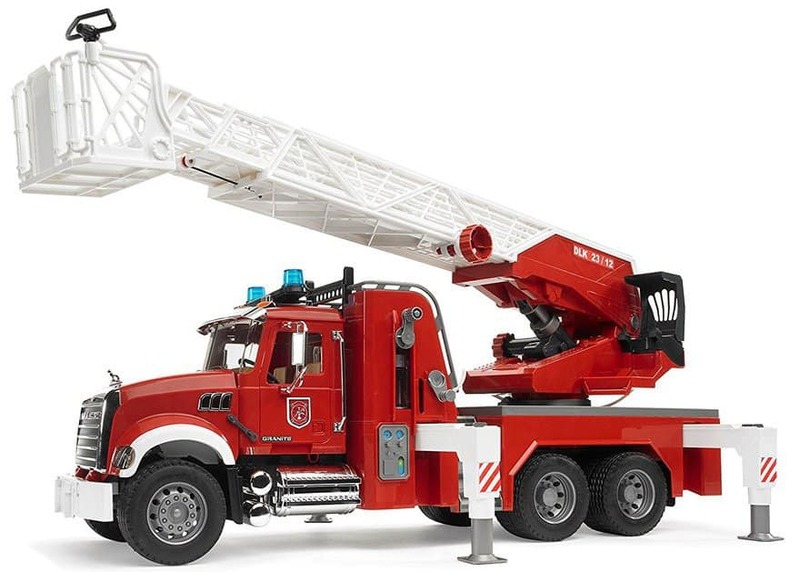 The truck is made out of sturdy material, which means that it can withstand banging and impact during playtime While it not may fit most terrains outside, it’s perhaps the best firetruck toy for inside playing. What makes this firetruck so good is that it comes with the 8 figures, 7 of which are various heroic dogs and the last being their leader, a boy named Ryder. It’s an ideal choice for everyone looking to enhance their child’s imagination and promote longer periods of playing time. Because of the dog being neutrally designed, even girls will love this toy. The size is also ideal for small hands and easy gripping. Made for children 3 and up, this firetruck is perhaps one of the best options for educational toys. It runs on 3 AA batteries, which are connected to the “engine” that powers the wheel drive. Boys will find this toy particularly interesting. It’s also easy to explain the basics of automotive technology using this toy as an example. The driving mechanism includes forward driving and turning left and right. Accompanying the mechanism are sounds for rescue, along with music and additional vocal recordings that can be controlled. This is great for three-year-olds, as they will get hours of non-stop excitement to keep them busy. There are no moving pieces other than the wheel and the ladder. In addition to the ladder, kids will be able to use the hook to save people and reenact scenarios. 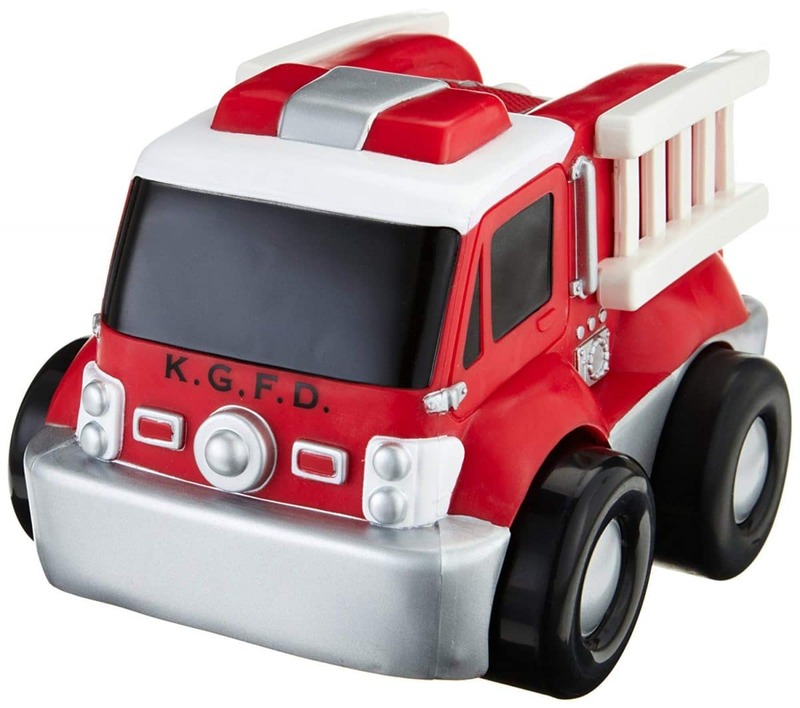 Toddlers prefer firetrucks like this one, mainly because of light and siren features. This Kid Galaxy model lets your child improve their grip while pushing it either inside or outside. The wheels aren’t built for every terrain and they can get damage if you let your kid play with it on unstable or rocky terrain. There are three big buttons on the side of the truck and each activates a corresponding siren or action sound. The child can also activate flashing lights, located on the hood and on each side. It’s built for all ages, with added safety measures such as the absence of sharp edges or corners. Due to its lightweight, this firetruck can’t dent furniture or walls. Why we like it: Bright lights don’t excite just toddlers, but even older kids will find them interesting. It’s excellent for indoor play. Older children don’t like just to control their firetrucks. Instead, a firetruck that changes directions will provide new levels of fun. This WolVol model is sensitive to impact and changes directions immediately upon harder contact. When this happens, the truck might run into a piece of furniture and get stuck, but this adds an additional benefit – problem-solving. The lights are exceptionally bright and flash in three different directions. They are accompanied by three different sounds, including sirens and other recordings depending on the action. It’s remote controlled and requires 3 AA batteries to function. This firetruck is also beneficial in terms of physical activity. Younger kids will find chasing the truck entertaining, mostly because you can never know where it goes. 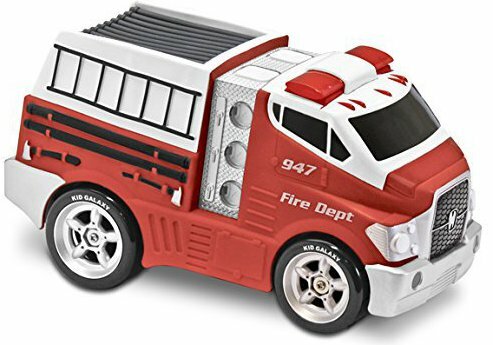 This remote controlled firetruck is a good choice for a toddler’s first toy. You will find the control system very engaging, as it provides hours of interactive play for the toddler. They just have to hold a small steering wheel-shaped RC and navigate the two buttons. Something that toddlers will love the most is the spinning function, which causes the firetruck to rotate out of control. There are no moving parts and the toy has been FDA approved to be safe for toddlers and kids 2 and up. It drives excellently on most indoor surfaces and generally doesn’t malfunction if stuck or if it falls down from a moderate height. 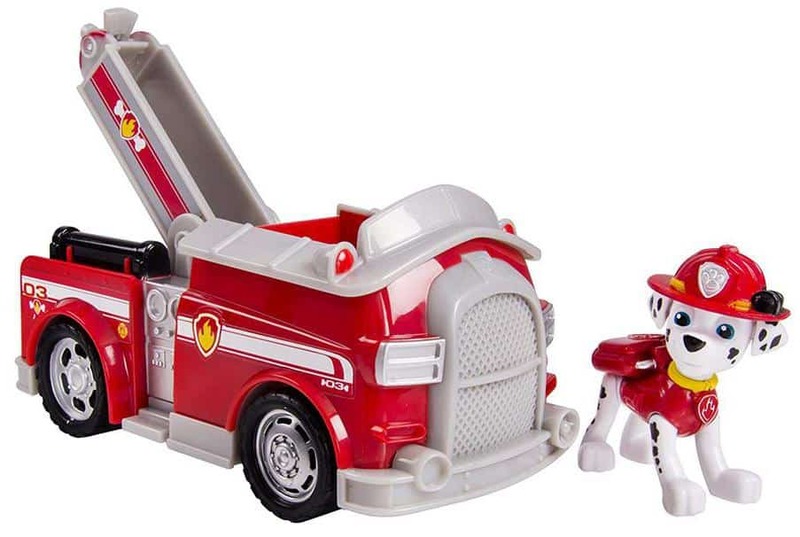 This Gizmovine firetruck is great for both kids and toddlers. It enhances creativity because of the many scenarios the kid can create and partake in. It’s easy to move and it can be gripped from any side. This feature makes it ideal for toddlers who have to practice grip strength, as well as the notion of holding things without dropping them. The materials used are sturdy, allowing the truck to withstand impact without damage. It also has four different sounds to help the child create different rescue scenes. There is also an extending ladder which adds different options for various rescue scenarios. The wheels are made out of strong materials, giving your child the option to partake both in inside and outside playing conditions. It’s also small enough to be carrier to kindergarten or on vacation. Why we like it: One of the better-designed firetruck toys on the market, due to an extremely responsive remote control system. For children who love details and bright colors, this is an excellent firetruck today. In the period from 2 to 6, children crave visual stimuli through their toys, in addition to functionality. This particular model addresses both needs, as every detail is as realistic as possible. The design has been modeled to resemble real firetrucks as closely as possible. The size is ideal for toddlers, as there is a lot of room for gripping. Couple with a lightweight design and small size, your kids can easily carry this truck wherever they want to go. What’s best about this truck is the very impressive RC system. The truck can be directed to go in all directions, just with the single touch of a button. To power it up, you need a set of 5 AA batteries. Kids ages 1 and up have to play in a which develops their observational capabilities. This remote controlled firetruck is ideal for honing these skills, as it is fast and easily controlled. The RC controlled is in the shape of a steering wheel, which makes it easy to hold for your kid. With the controls, the child can operate the vehicle in the following directions – forward, left and reverse. To make the experience even more interactive, there is also music and the ability to product honking sounds with the press of a button. Toys like this are increasingly important because children are becoming more and more used to phones and tablets. The audio-visual experience is complete with this firetruck today and is able to keep your kid occupied for hours at a time. Why we like it: This truck is a very useful educational tool, with voice features in both English and Spanish. It also comes with a self-operating setting, which is useful during extended periods of playtime. Children do have the capability to learn things more easily, but they mostly do so through fun. This WolVol firetruck mode is an excellent tool for toddlers and kids to learn English or Spanish. Voice controls are interactive and urge the child to repeat for easier memorizing. There is also the factor of unpredictability. As the car bumps into an obstacle, it immediately changes directions. This feature makes it a useful toy for physical exercise. Due to its small size and appealing size, toddlers and younger children will chase it until they fall tired. After some time, the child will learn the names and terms related to various departments, such as the police and the fire brigade. 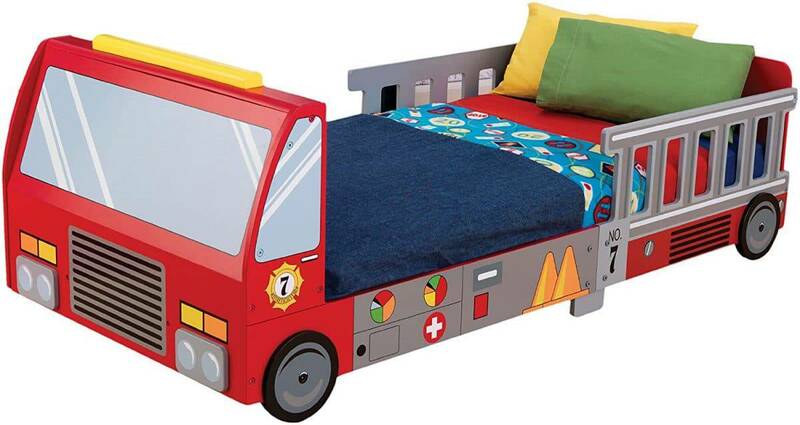 Why we like it: If your child is obsessed with firetrucks, this bed will enhance effort and increase the will to play. It also has a very strong build for a toddler bed. KidKraft specializes in making children’s beds and this one is a fine example of a firetruck design. It’s initially meant for toddlers and very small children, as it has a limit of 50 lbs. 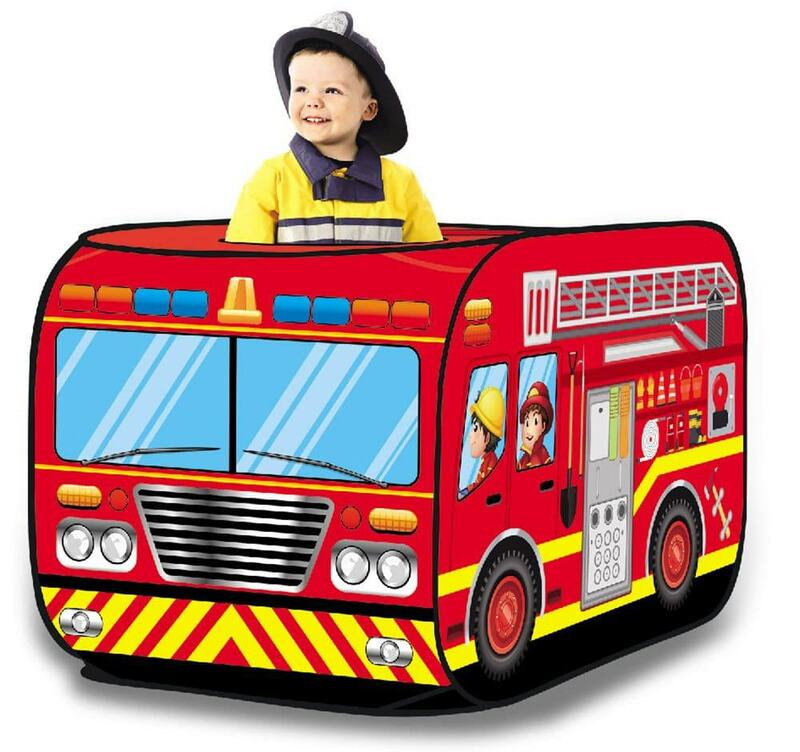 If the child is particularly rowdy and likes to touch and inspect everything, this firetruck toy bed is an ideal choice because of its silk-screened design. The details are very hard to scratch off. The entire design is very well incorporated into the theme of a firetruck. The rails by the headrest are meant to look like safety ladders on a real firetruck. An added benefit is that it perfectly fits all standard crib size mattresses and sheets. It’s made entirely out of wood, which makes it easy to move and pack. Why we like it: This truck has a large number of songs, different controls and mechanisms for interactive playtime. 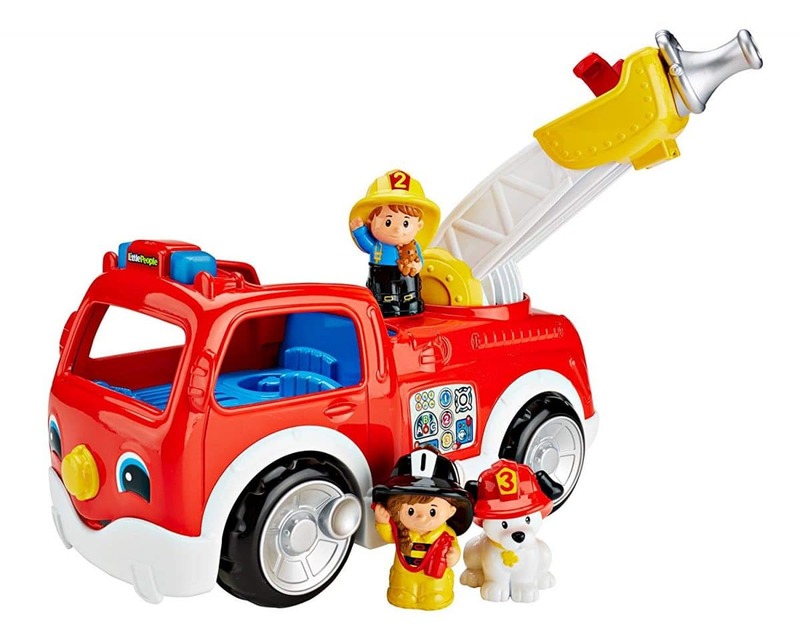 This particular firetruck focuses mostly on the learning aspect of playing. The toy includes more than 25 different songs, phrases and sounds. With just a few hours of playing time, your kid will know all the colors, including some basic knowledge on fire rescue brigades and opposite words. This makes it ideal for toddlers and very young children who are in the period of linguistic formation. 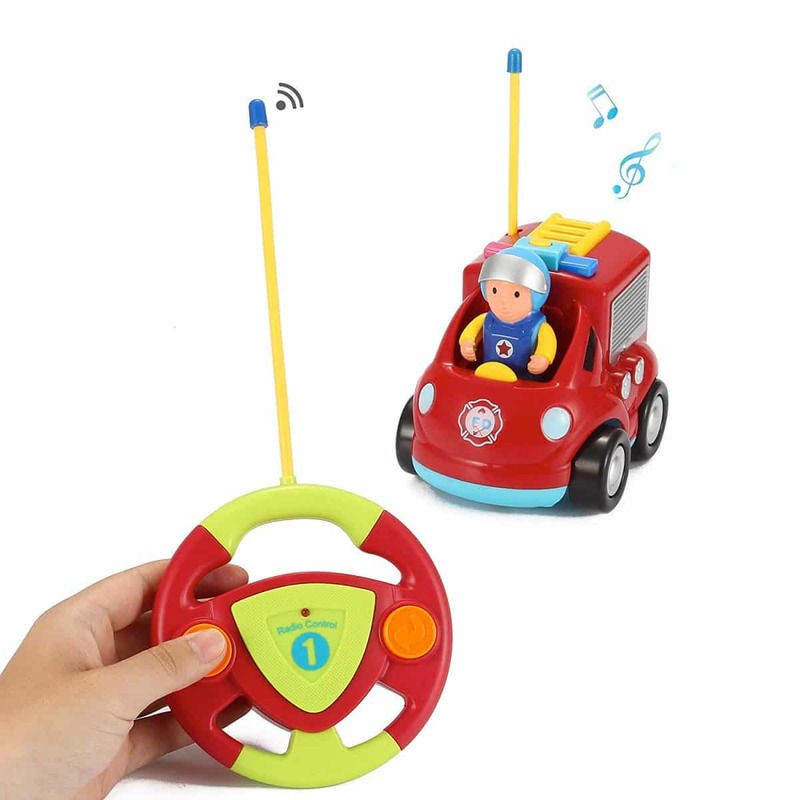 By pushing the toy, the child activates the songs. 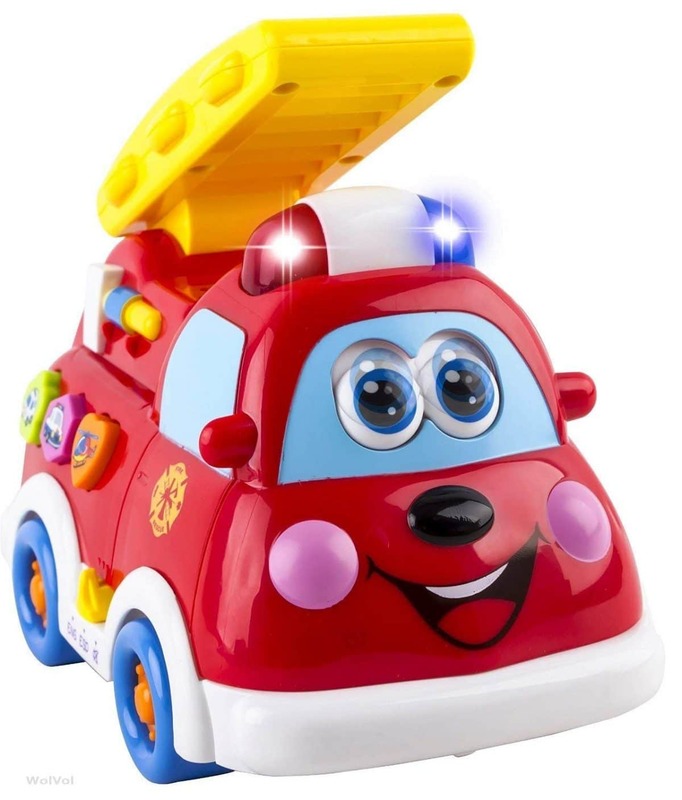 Almost any action with the firetruck, triggers a song or a phrase. Most of the activity is centered around sliding action figures down the ladder. This activates a set of lights and lessons centered around rescue and fire safety. The driver’s seat and other button also activate their own special phrases and songs. Why we like it: The bubble action adds another entertainment factor that every child will adore. 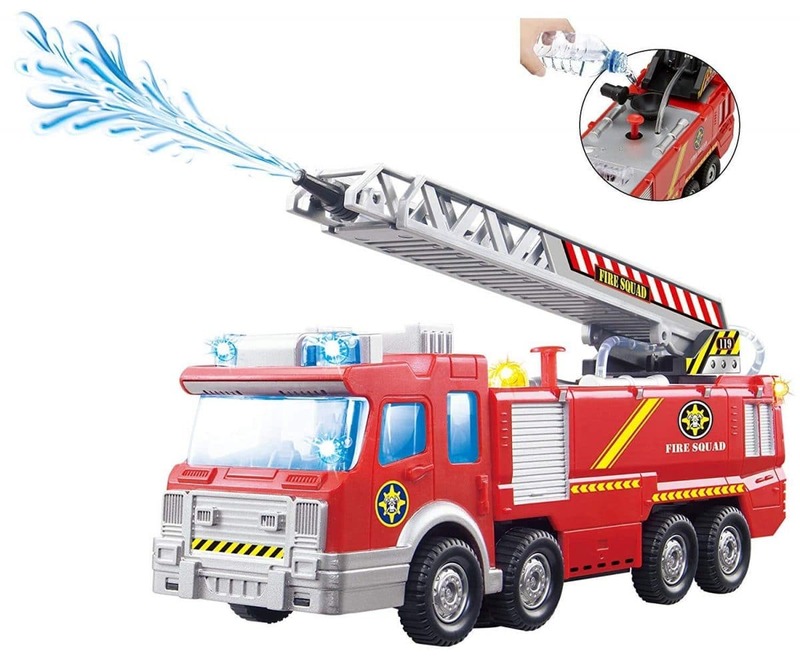 With this firetruck toy, you’re giving your child a new, interactive way of playing. The remote control makes the car easy to operate. Even toddlers can understand the mechanisms and play with the firetruck all by themselves. The design is very lifelike and adds to the experience of participating in an almost-real rescue mission. 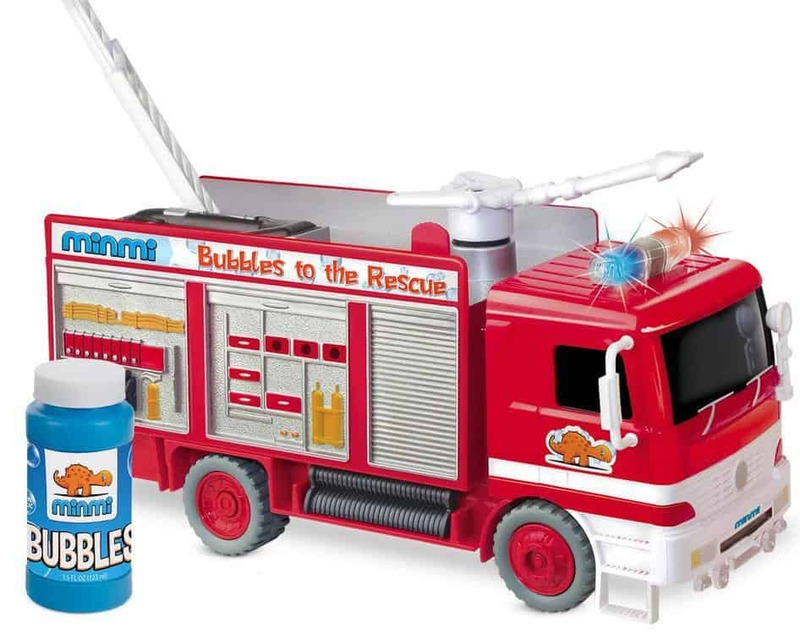 What makes this firetruck such a good choice for young children is the bubble burst action. Within the pump, there is space for a 120ml bottle of water or bubble solution. The truck already comes with the bubble solution and your kid can try it out immediately. The burst action is particularly strong and it releases several thousands of bubbles, both small and big. Why we like it: Very sturdy build, can withstand drops from even the first floor. The realistic and loud sounds contribute to interactive playing. 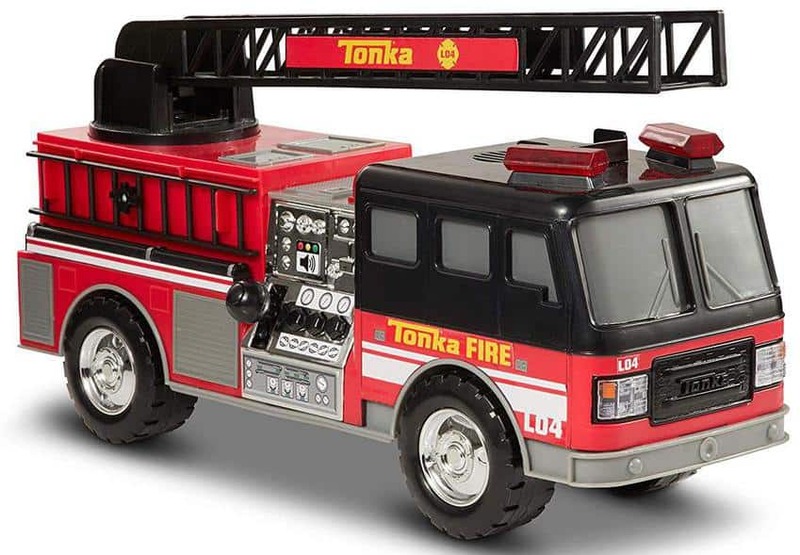 Tonka have always been great at making toy trucks and this firetruck model is no exception. The wheels are exceptionally mobile and can go over most obstacles, such as other toys, carpets and other objects commonly found within a house. 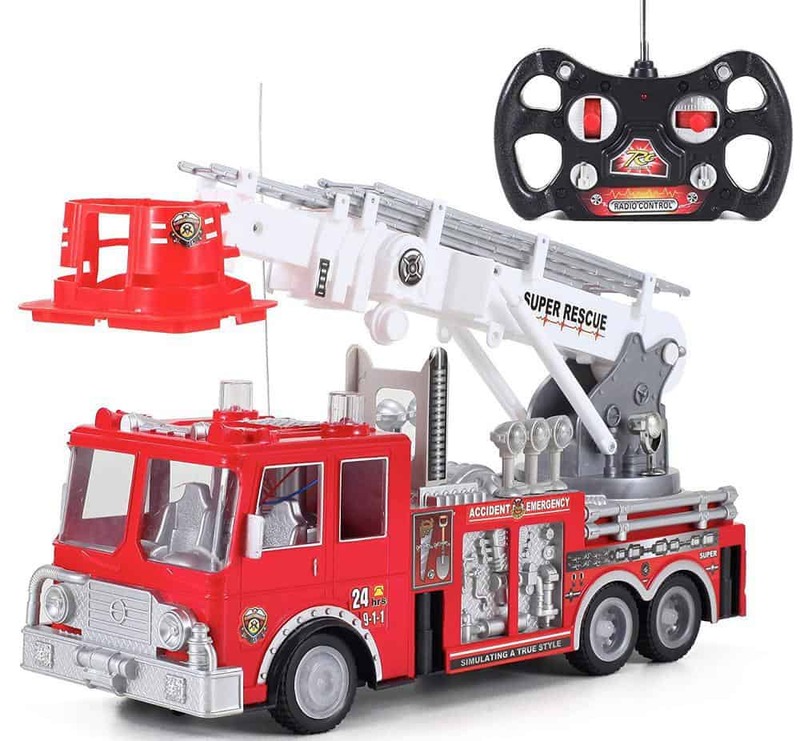 The most impressive feature of this firetruck for kids and toddlers is the motorized ladder, which allows for lots of interactive rescue scenarios. The ladder can extend both upwards and to the sides. All your child has to do is pull a lever and set the ladder and they deem fit. The presence of this ladder is an added benefit for toddlers who need to practice grip strength and grip sensitivity. All of this is rounded by a lightweight, but very sturdy construction from top to bottom. Why we like it: Teaches kids everything they need to know about emergency services and rescue missions. It’s also very easy to grip for children of all ages. Firetrucks can also be educational tools and this particular model is an excellent example. It comes with a motorized mechanism that allows the children to learn the basics of object manipulation. With the RC, you can drive the truck forward, with only slight swerving enabled. It’s an excellent way to teach toddlers how objects move and how can they influence that movement with their own two hands. The educational aspect is mostly centered around sound-related functions. Music and rescue sounds teach kids how to recognize fire trucks in real life. In addition to this, the child can also activate phrases specific to emergency services. An ideal choice for kids of all ages. 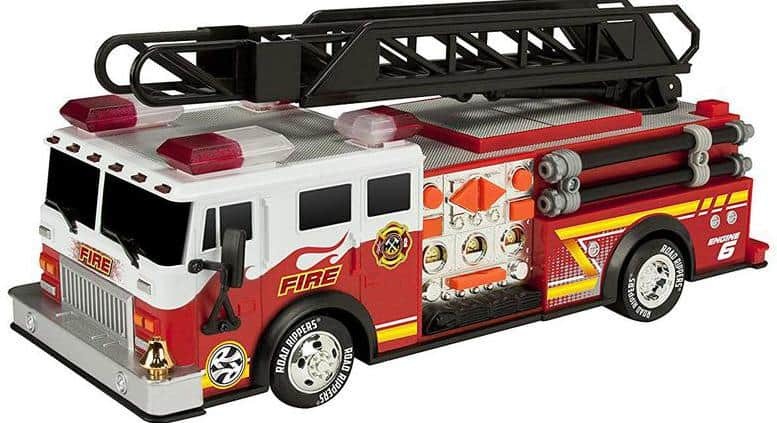 Why we like it: The package includes an amazing variety of firetrucks and other related. This toy set is one of the better ones available because of both durability and versatility. With 40+ pieces, you get almost every vehicle that the average fire brigade has. The more specialized ones are equipped with cables, retractors and ladders for a more realistic feel. Parents can use this set to play with their kids for hours, but there are educational options too. Scenarios can teach the kid all about the work of an average fireman. Every piece has been FDA approved and is safe for children of all ages. Due to the complexity of this set, it might be best if your child is 3 years and up. There are extra road signs and victim figures, which makes any fire-related scenario possible for reenacting. Why we like it: Very mobile ladder that can be moved with a moderately strong push/pull action. Sounds are pretty loud, too. 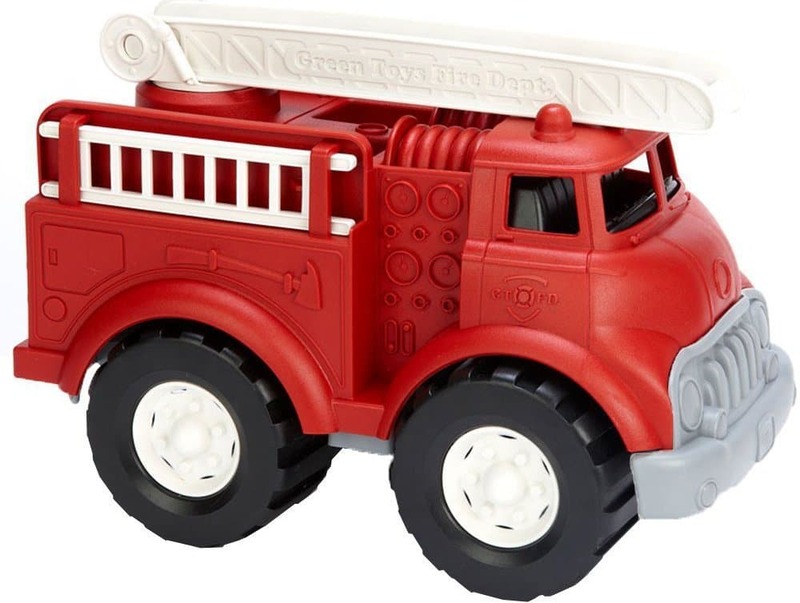 Tonka are renowned for their sturdy firetruck toys and this one can also withstand smashing, dropping and other accidental or purposeful impacts. The build is quite strong, as there are no moving parts aside from the ladder. It’s relatively high so that your child can reenact rescue scenarios with relative ease. The packaging is easy to handle and is made out of light, but strong materials. The wheel mechanism deserves some praise as well. It shows exceptional mobility and durability when placed on both indoor and outdoor services. The plastic has a fine finish, making it easy to grip even by toddlers. Manually activated lights make for a spectacle that any child will love. Why we like it: One of the larger models available, great for kids who like bigger challenges. 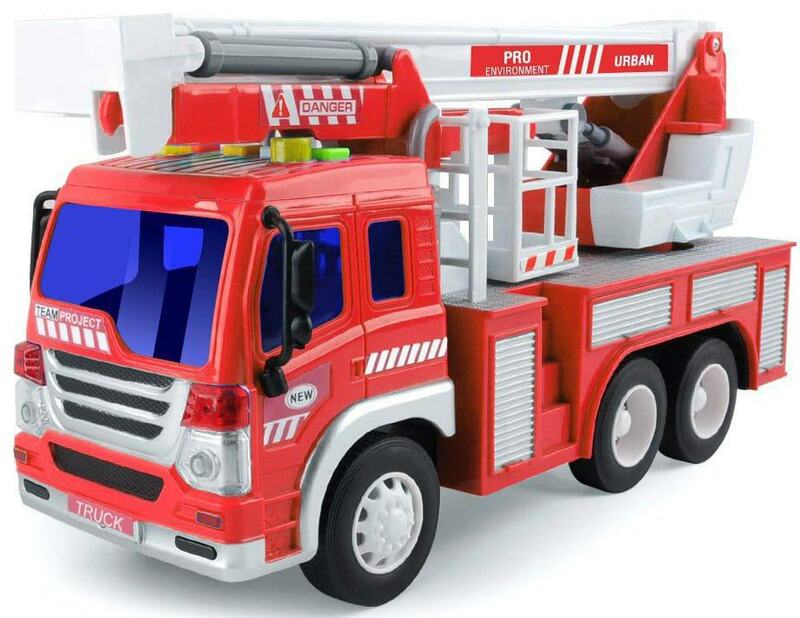 The most impactful features of this toy firetruck for kids and toddlers are the hook and ladder systems. It’s important to note that the ladder is a heavy duty one and can withstand exceptional amounts of pulling and pushing by a toddler or kid. The hook is an added benefit, as it allows combining this toy with others in order to create realistic rescue scenarios. One other thing that sets this model apart is the unique stabilizing mechanism. It is made to allow the firetruck to stay stable even when the ladder is fully extended. The 16 lights, combined with various horns and sounds, make for an excellent tandem. A button-based mechanism allows for the lights either to flash or glow in a steady manner. Why we like it: Adds a different, more interactive approach to firetruck scenarios. Easily collapsible and lightweight – ideal for carrying anywhere. This tent is a unique twist on the classic firetruck toy format. It allows your child to completely immerse himself or herself into various rescue scenarios. The material is non-woven polyester, which makes it impossible to rip or damage even after years of playing. With the unique nature of the fabric, it’s easy to remove stains from it on a regular basis. Another impressive thing about this firetruck toy is the simple pop-up mechanism. It’s so easy to follow and memorize that kids can assemble it all by themselves after just watching you do it. There are two openings, on the top and in the back. The back opening is a nice touch, as it is ideal for rescue role-play situations. Why we like it: While identical in features, the two included trucks are slightly differently designed. The set includes an ideal number of movable parts to ensure interactive play. Wonder Toys comes with a great pack of two trucks, both equipped with the same features. They are exceptionally heavy, as they’re made from cast metal. In comparison to the classic plastic build, this choice of materials promotes grip strength development and weight awareness in younger children. The aim was to create a realistic feel, with both doors able to open. There are even small controls inside, which is not something seen often. Playing options are abundant with this particular firetruck. The sirens are very realistic and remain loud even after months of continuous playtime. 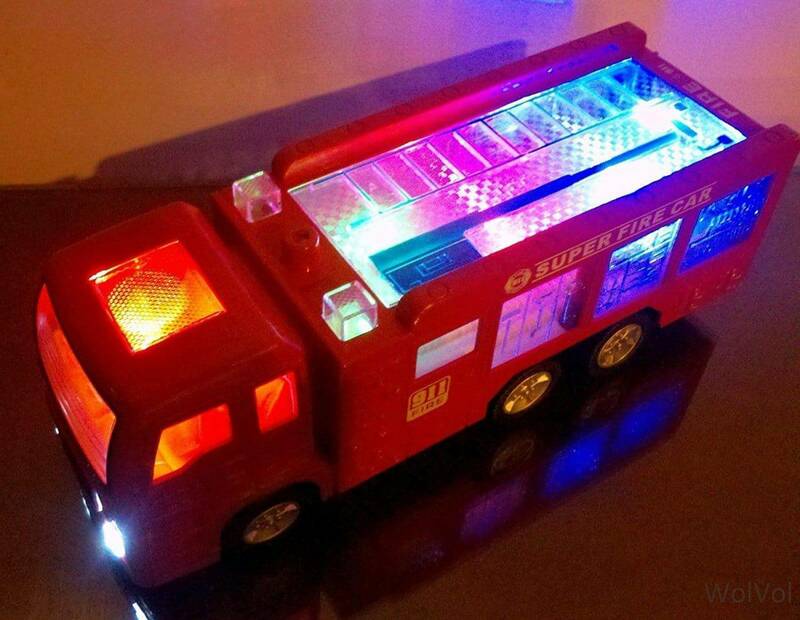 With flashing lights, you can ensure that your child is visually stimulated and motivated to play with the truck. Why we like it: The pump is strong and ejects lots of water in one push. The entire truck is very sensitive to bumps, immediately changes directions and does to effectively. With firetruck toys for kids & toddlers, it’s important to have a large number of features. This Top Race truck model comes with a battery-powered pump that can eject water of up to 6 feet in the air. The batteries for the pump last a relatively long time, even for months at a time. The water-ejecting pump is connected to a movable ladder. You can twist and turn the ladder in all directions without affecting water pressure. What else is impressive about this firetruck is the bump-sensitive mechanism. The moment your child directs the truck into an obstacle, it will immediately change directions. This unpredictability factor accounts for a lot of fun, for both solo play and group sessions. Why we like it: A fun way to learn all about the most important phrases related to emergency services and firefighting. Sirens are triggered whenever the truck is rolled. Using this firetruck, your kid can learn valuable words and phrases in a fun way. 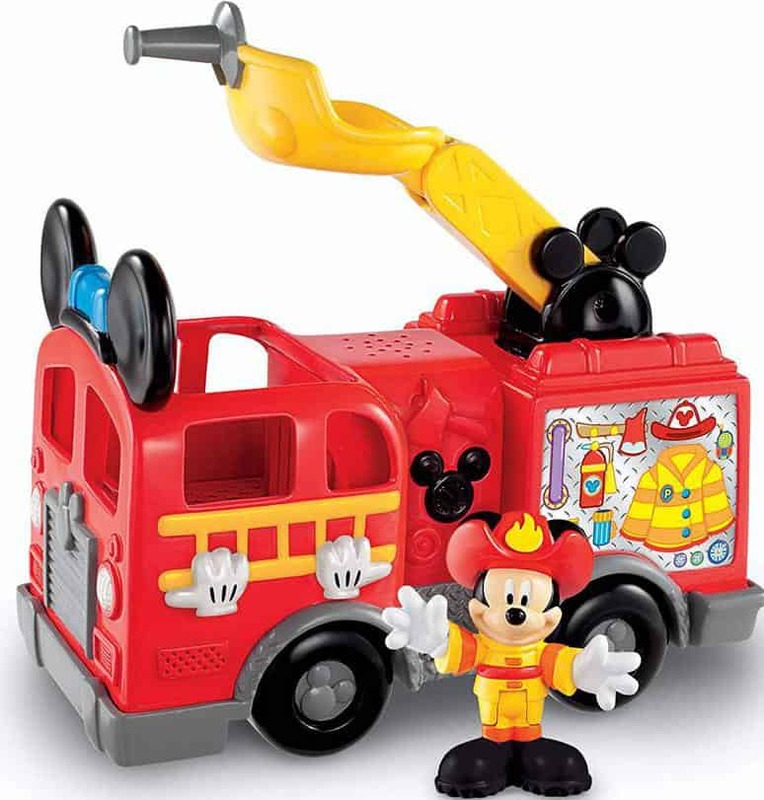 The truck comes equipped with a Mickey Mouse figurine, dressed in a fireman’s uniform. You can place the figurine both on the control station and on top of the truck. Any kid will love reenacting firefighting scenarios with their favorite Disney hero. Whenever the pump is raised or the truck is rolled, Mickey will say something. There is a relatively large variety of phrases, ensuring that your kid won’t get born after a little while. The mobility of the truck is at an exceptional level. With the absence of sharp corners and edges, you can ensure that the child will play safely, without injuring themselves or damaging furniture. Why we like it: Perhaps the most mobile ladder on any firetruck toy available. The set includes female firefighter figurines to teach kids about gender equality from an early age. LEGO always focuses on both education and fun. Compared to other LEGO vehicle models, this one is easy to build but still requires some thinking. The building process has been specifically designed to help kids learn about different shapes and how do they interact with one another. 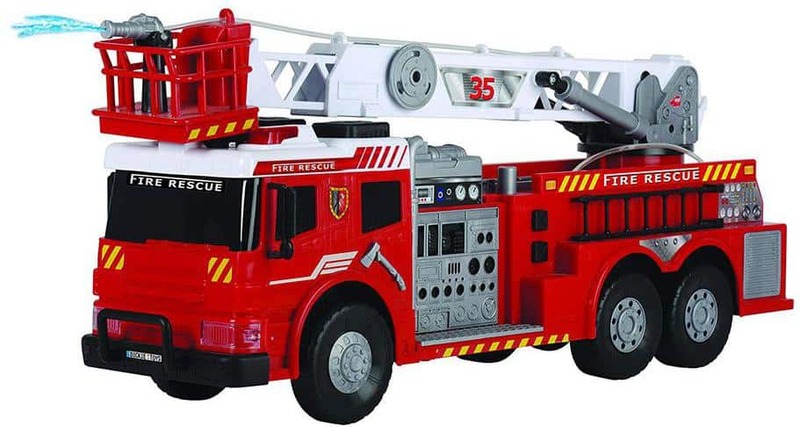 The highlight of this firetruck toy is the ladder, which can spin 360 degrees. It’s easily movable, which enables a lot of different playing scenarios. The ladder also includes a stud-shooting mechanism, which gives a fire hose-like feel during playing. 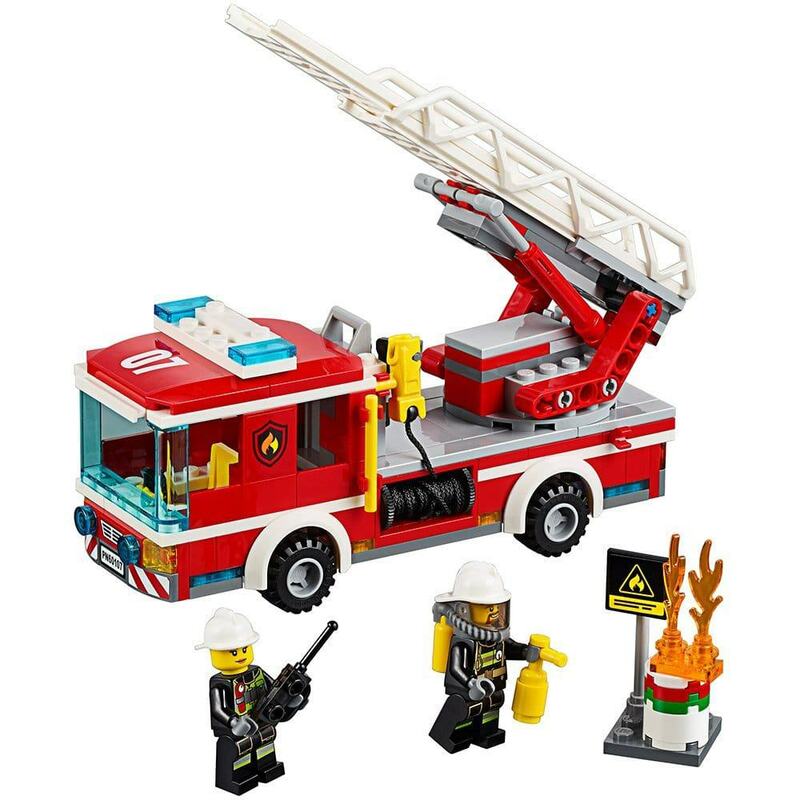 The set includes figurines of firefighters of both genders, as well as small fires and road signs. Due to the small size of the parts, it’s not ideal for kids under the age of 5. Why we like it: A strong build, despite the light weight, makes the toy resistant to dropping and smashing during playtime. In this German-made firetruck toy for kids and toddlers, a child can get a long-time playing aid. It’s made out of eco-friendly and sturdy plastics such as ABS. The design does a great job of blending build qualities with mobility, resulting in one lightweight firetruck model. It’s also one of the more realistic models on our list, built to mimic German fire engines. The ramp is able to turn in all directions, with stabilizers ensuring that it stays in the place that it’s put in. A second set of stabilizers puts the engine in place if your kid doesn’t want to roll it. This makes a great addition for all kinds of playing scenarios involving putting out fires. Why we like it: Real tires and chrome finish add to a complete vintage experience. It’s also easy to drive. 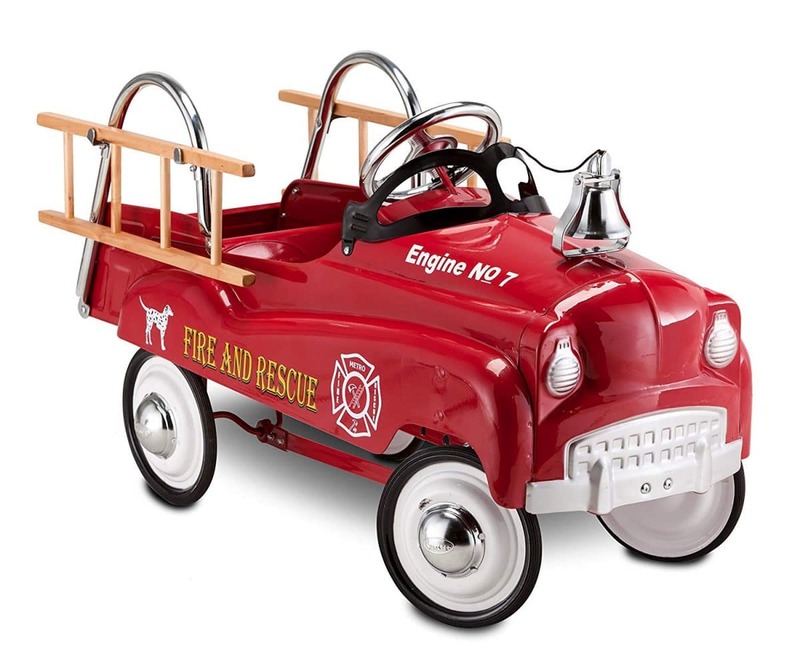 If your kid is bored by regular firetruck toys, this vintage version is a great way to change things up. Modeled after real-life early 20th-century model, this firetruck can bring new flair to regular firefighting scenarios. The vintage design is also a great excuse to teach your child about the automotive history and the way cars work, down to the smallest details. The pedal height is adjustable, meaning that it can’t be outgrown. With a weight limit of 70 lbs., it’s sure to last a number of years. The wheel is easy to control and responsive even to the smallest movements. This is also a great way to introduce your kids to the concept of driving, as well as basic spatial awareness. Why we like it: This truck has one of the most mobile ladders on all firetruck toys. This realistically designed fire engine gives your child the opportunity to reenact fire rescue missions down to the smallest details. A big reason for this is the water pump with added details resembling water. There are also three fire extinguishers included, adding up to a complete cast of firefighting accessories. The goal is education through fun. One of the best parts of this firetruck is the rotating ladder. With a maximum reach of 350 degrees, it can be set for any desired scenario. The basket has enough space for action figures, if your child already has any. The light and sound effects round out a complete experience and educational bonanza. Why we like it: All the major rescue vehicles are included, with exceptional attention to every detail. Even smaller firetruck toys from kids & toddlers are great for various scenarios. This themed set is made with the Fire Department of New York City in mind. There are five vehicles included in the set, which allows for a large variety of playing options. There is a regular firetruck, along with a smaller car, a van and two special rescue vehicles. This variety is an excellent educational benefit. All the vehicles are made out of cast metal, with no moving pieces whatsoever. They are not as mobile as most other toys on this list, but are beautifully designed with small children in mind. Every detail is realistic and there is enough space for practicing grip for toddlers and smaller kids. 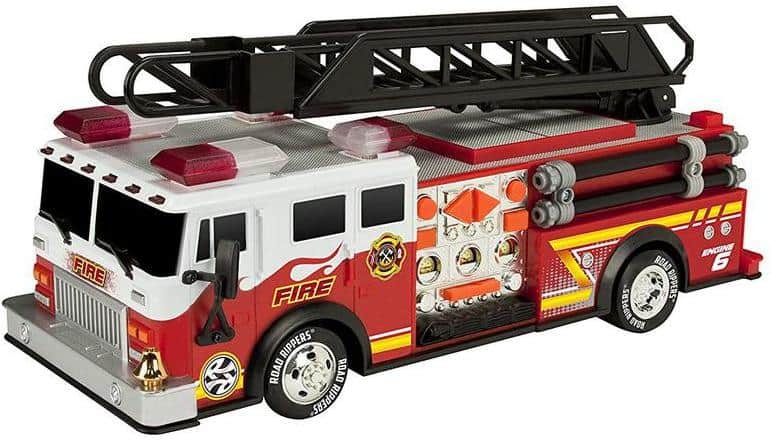 Finding the best firetruck toys for kids & toddlers has a dual purpose. Through fun, any kid or toddler may learn valuable things about emergency services and how do they work. For toddlers, playing with the right firetruck can improve creativity, spatial awareness and manipulation skills. There are a lot of different toys on the market. Some of them are catered more towards education, but the last few years have seen a lot of versatile model appearing. Any one of these firetruck toys is an ideal gift, too. We hope you will make the right choice to make your child happy.